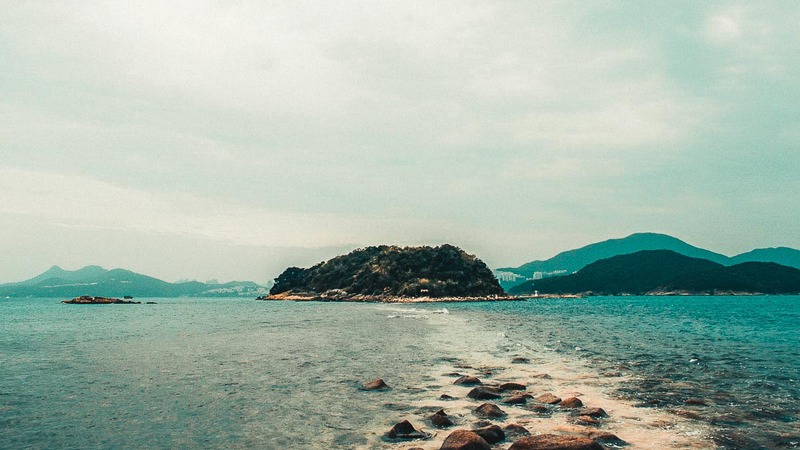 For the adventurous seeking a dose of nature in Hong Kong, Sai Kung comes as a nice surprise. 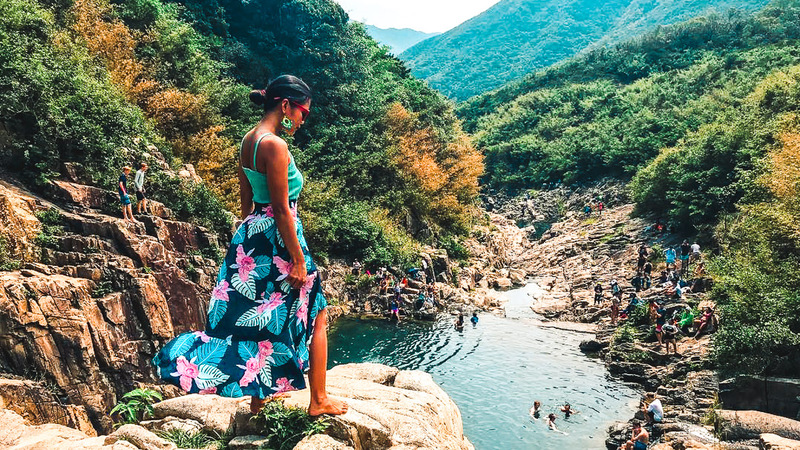 Here are seven types of day trips to Sai Kung for those looking to hike, try out water sports or simply sightsee and eat! Hong Kong’s lined with skyscrapers and bright city lights which are all too familiar. And then there’s Sai Kung, a sanctuary of unbridled nature with the friendliest locals, hiding by the seaside. 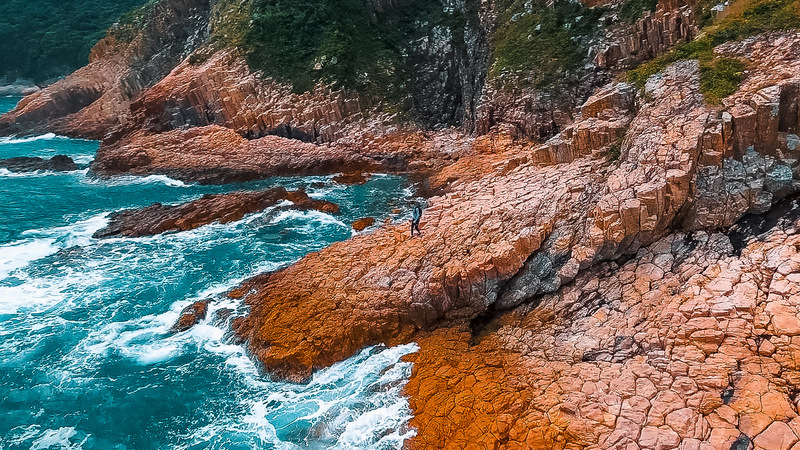 There’s so much Sai Kung has to offer — from coastal hikes along beaches to cliff jumping and even surfing. Not to mention rounding off the day with the freshest seafood! Despite the many activities in Sai Kung, it’s not busy like the city. There’s a chill vibe and positive mood about this place and its people that’s special, making it worth your while to spend a day here. 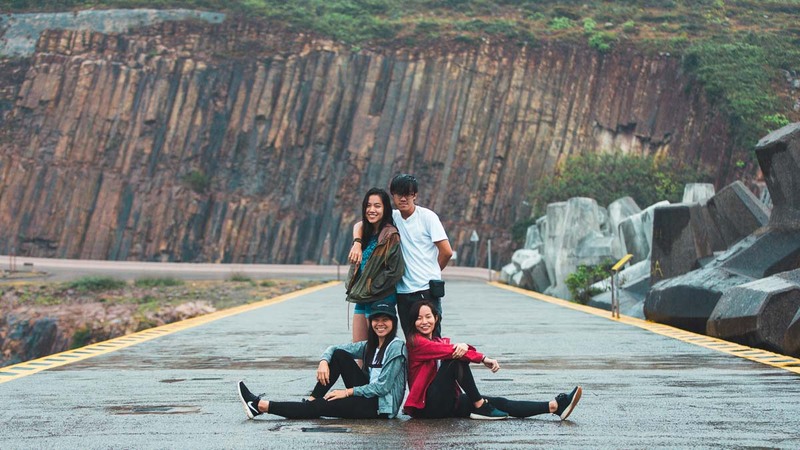 Had our own mini photoshoot at the High Island Dam! Sai Kung Promenade (at Sai Kung Pier)! Sai Kung Pier acts as the base to all attractions around Sai Kung, where the main bus terminal and most taxis are. 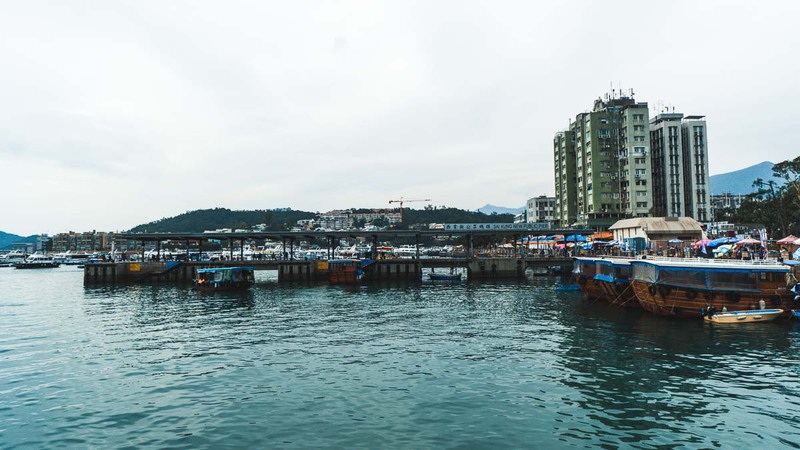 Regardless of your route, Sai Kung Pier is where you’ll start. The pier has its own hustle and bustle — fishermen in docked boats selling their catch for the day, seafood restaurants lining the coast and boat tour operators setting up makeshift stalls along the pier. Getting to Sai Kung Pier: From Choi Hung MTR Station Exit C2, take Green Mini Bus A1 to the pier (departs every 5 min, 25 min-ride). Getting around Sai Kung: Public buses run on a sporadic schedule (especially on weekdays). 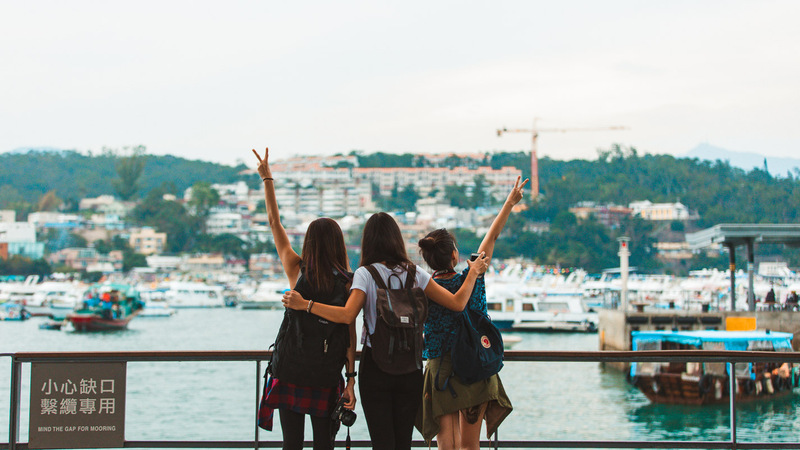 The most efficient way to get around is via a taxi, which is affordable especially if you split the cost amongst friends. Flagging one down in Sai Kung town is easy but if you’re outside the town area, you’ll need to phone taxi companies to make a booking (+852 23830168 or +852 2729 6600). 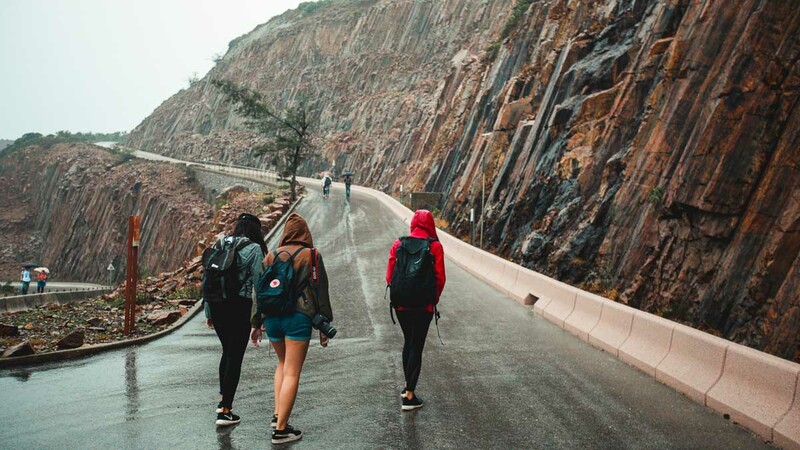 The 100km MacLehose Trail comprises 10 sections running through Hong Kong’s New Territories and is one of the most popular hikes in the country. It’s a long route, so most travellers only hike a part of it on a single trip. 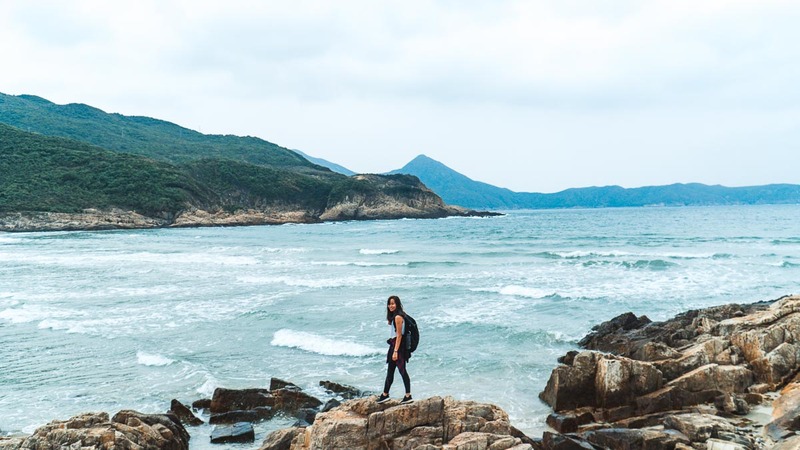 The Sai Wan Beach Hike (2km) is within Stage Two of the trail with beautiful views at the peak, and leads to a white-sand beach with uninterrupted ocean views. The mini bus no. 29R from Sai Kung Bus Terminus takes you to Sai Wan Pavilion (30 mins), where you start the hike. From Sai Wan Pavilion (西貢西灣亭), hike 30 mins to the peak via Lo Tei Tun, then another 30 mins down to the beaches. The terrain here is soil-based and could be slippery in wet weather, so wear proper shoes. We advise against hiking here on a rainy day! 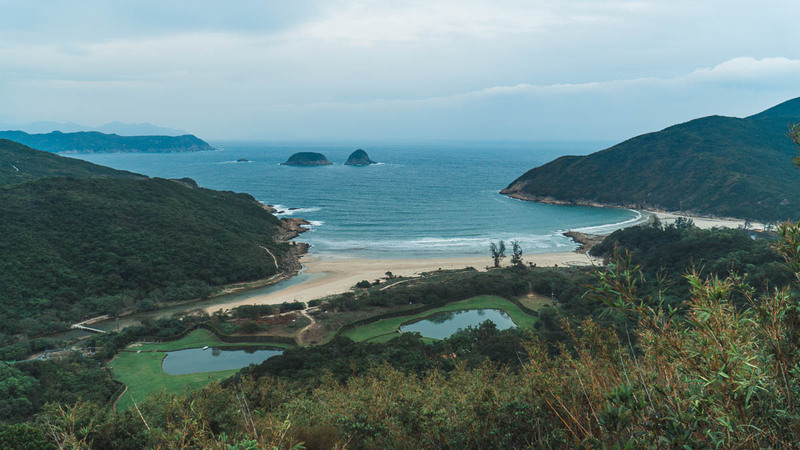 For a longer hike, you can opt for the Tai Long Wan (大浪灣) Route Hike (8km), which is an extension of the Sai Wan Beach Hike. 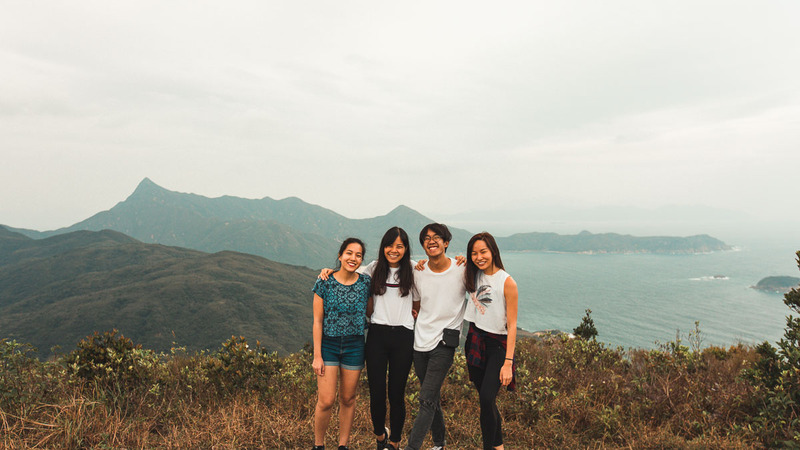 Instead of finishing your hike at the beaches, carry on walking along the trail, and you’ll face a gentle ascent up to another viewpoint of Ham Tin Wan (鹹田灣), Tai Wan (大灣) and Sharp Peak (蚺蛇尖). Hike back down and you’ll get to Ham Tin Wan (another beach), with restaurants around. 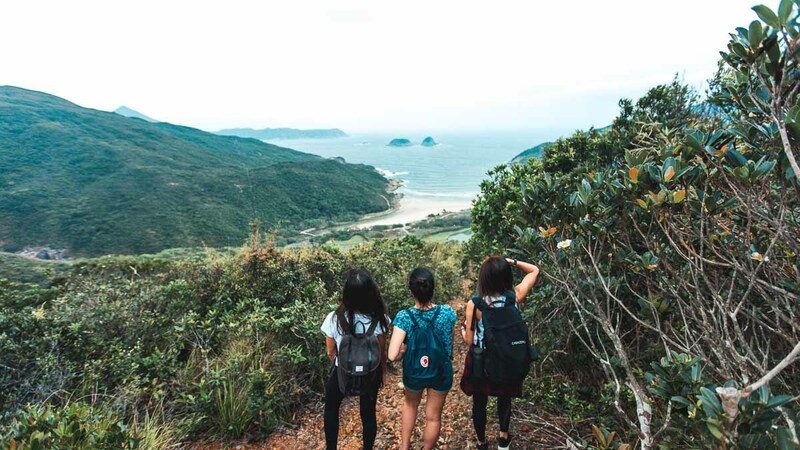 For hiking enthusiasts, start the day early and go for the Peninsular Hike instead, which is one of Sai Kung’s longest hikes (eight hours!) but takes you to all the best views around, including High Island Reservoir and Long Ke Wan. Starting Point: Sai Wan Pavilion. Take Bus R29 (HK$17, 30 min-ride) in front of McDonald’s at Sai Kung Pier. Departs every 1.5 hours. Return Route: In good weather, take a boat transfer from Sai Wan beach (From ~HK$150/pax) back to Sai Kung Pier. Or walk back to Sai Wan Pavilion and take Bus R29. Surf shops are available along the beaches, so pop by any one of them to rent your boards, or even take up surf lessons with the Hong Kong Surf School on the spot. The waves here are not the easiest to manage, so it’s best to go with a guide if you’re a beginner! 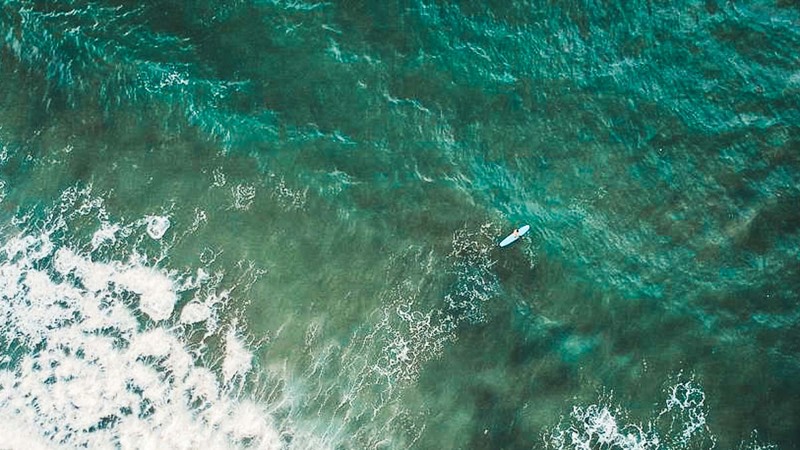 Where to surf: Sai Wan beaches (most convenient, best for beginners), Tai Wan (most consistent surf breaks), Ham Tin (smaller waves, but break closer to the shore). From Sai Wan Pavilion (see #1), hike through the MacLehose Trail (40 mins) to Sai Wan Village and Beach. Local shops and residences are scattered around the area. After enjoying the beaches, walk down until you see a stone bridge at the far corner, which is where Sheung Luk Stream‘s located. You’ll be greeted by a ‘Caution: Deep Waters’ sign, so proceed carefully as you get up to the cliff-jump spot (eight metres high!). Climb further up to the freshwater pools and waterfalls where you can start your jump. The whole area’s good for relaxing as well, so pack some food for a picnic and chill the afternoon away. Best time to cliff-jump: Jun – Sep (summer). Don’t visit when it’s rainy because tides will rise and the path up becomes dangerously slippery. 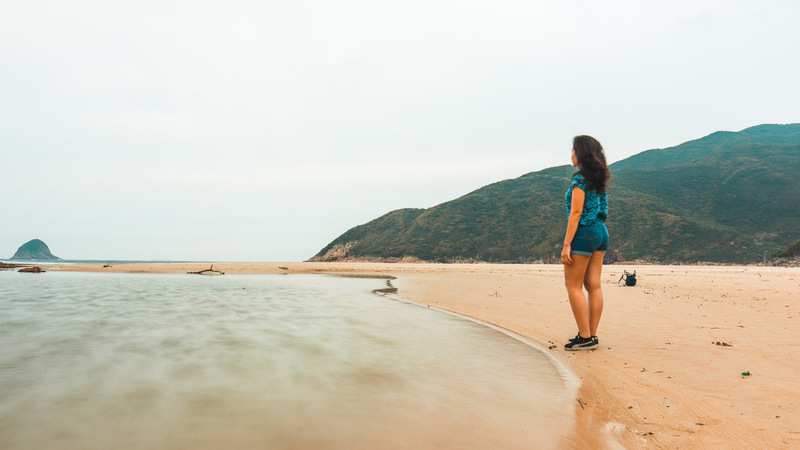 The Ham Tin Beach is not only known to be one of Hong Kong’s most beautiful beaches, it’s also small and secluded, and almost feels like a private beach to yourself. Here, tents and camping equipment (sleeping bags, kerosene for campfire, etc.) are also available for rent at On Knee Store or Hoi Fung Store, so you can even choose to spend the night under the stars! The restaurants also serve up affordable local cuisine (from HK$50). You can also set up camp at Tai Long Wan beach, beside Ham Tin beach. 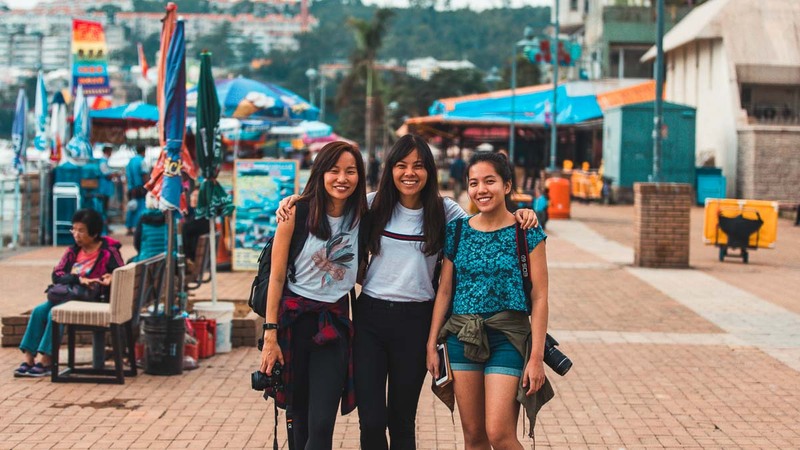 Walk across the bridge, past the restaurants and local homes, and you’ll reach Tai Long Wan, which is more camping-friendly and popular with advanced surfers. How to get there: From Sheung Luk Stream, take the stairs back down to MacLehose Trail 2. Keep walking for ~1.6km and make a right to Ham Tin Beach. 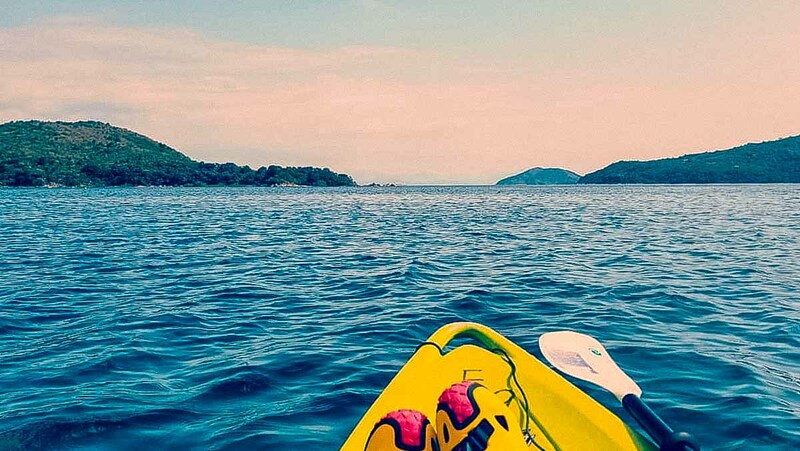 Sai Kung’s best sights can be experienced both on land and sea via kayaking and/or biking. Start your day by renting a bike from the pier. 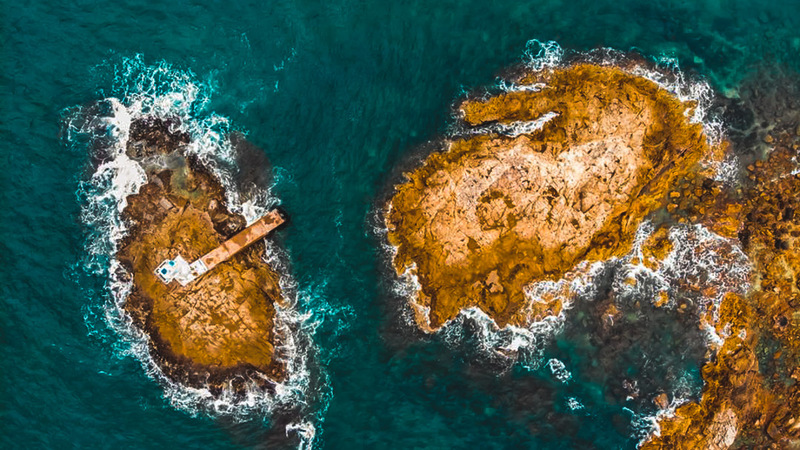 You can cycle around Sai Kung Pier, or further out to the famous Hexagonal Rocks and landmarks of the UNESCO Global Geo-park. Alternatively, go for a short kayaking expedition around the Global Geo-park’s caves, rock formations and cliffs. 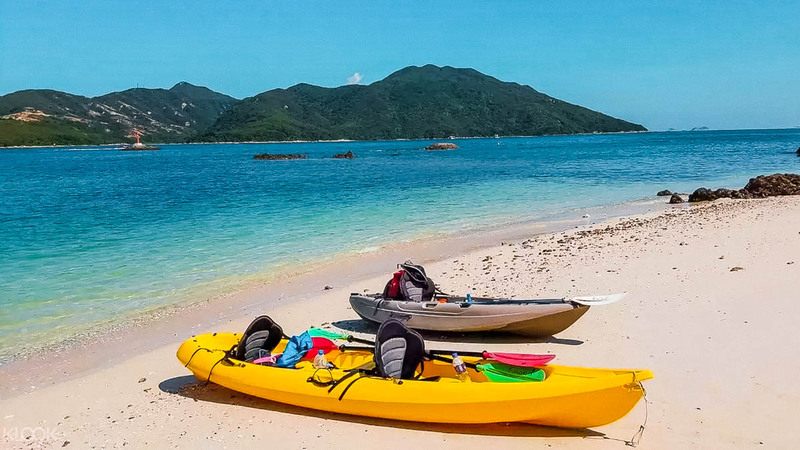 Row off from Sha Ha Beach, which is conveniently located at the end of the Sai Kung waterfront promenade, or Hoi Ha Wan, a marine-park beach (where you can spot starfish and corals from the surface)! If you prefer navigating the waters with a guide, day tours are available too. For those ambitious enough for a full day of activities, do both kayaking and mountain biking to cover all bases — all in a day’s work by sunset! *Pro-tip: Call to make reservations three days in advance, especially for bike rentals, because the shops have to transport the bikes from the city to Sai Kung itself. 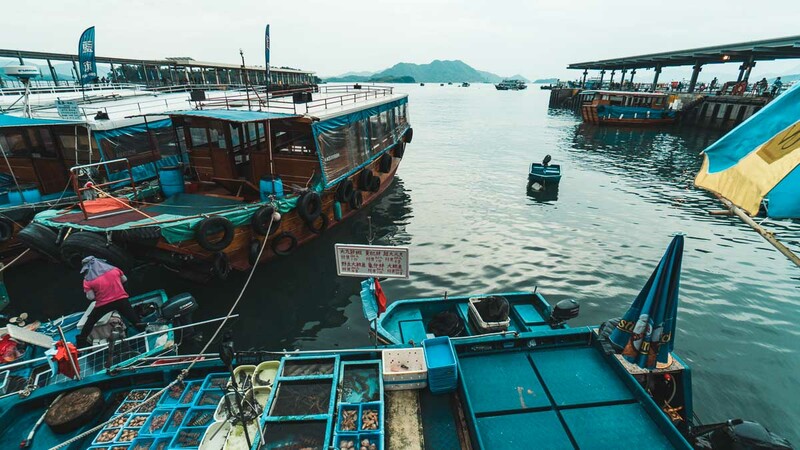 Local operators at Sai Kung Pier offer boat tours to take you around the best sights… without any hiking! Private tours (HK$200 for three hours) take you to 10 photography spots. Though most don’t allow you to get off but just view the sights from the boat, some will drop you off at Sharp Island. 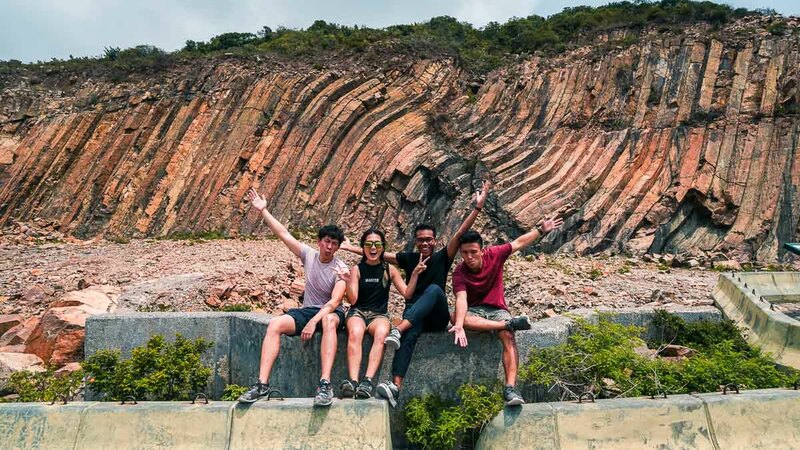 Probably Sai Kung’s most unique natural feature, unique hexagonal rock formations from past volcanic activity can be found everywhere, including the famous East Dam Reservoir (next point). 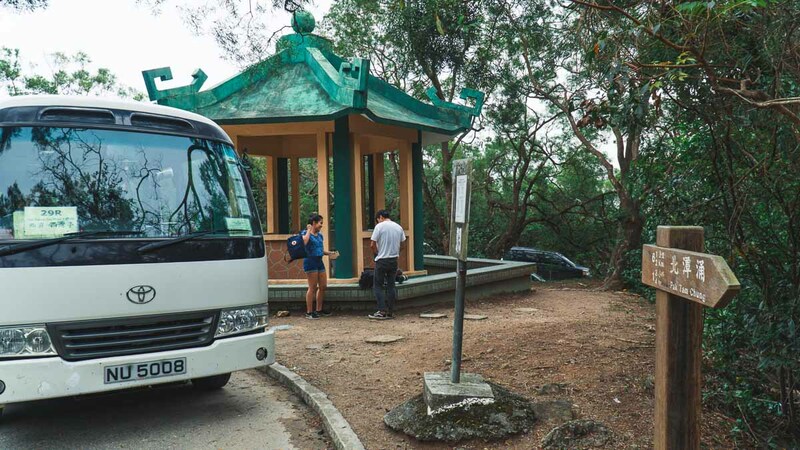 The Geopark Boat Tour (S$154) will take you to some spots, though you can also see them by taking a taxi to the reservoir. 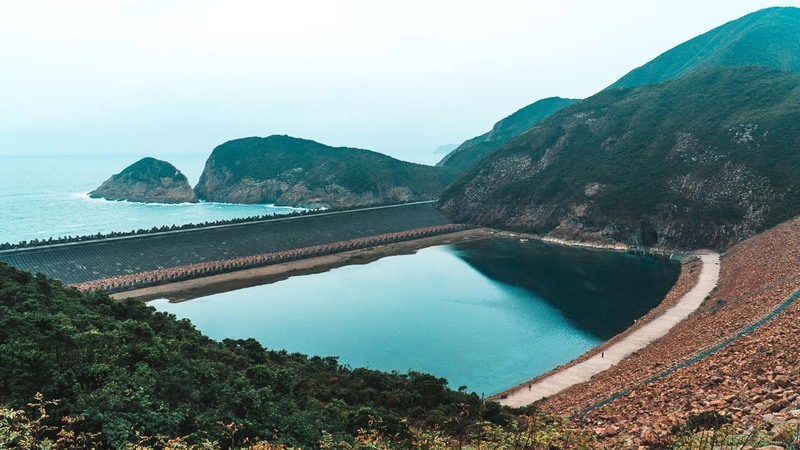 Part of Stage One of the MacLehose Trail and standing as the largest reservoir in Hong Kong, the High Island East Dam Reservoir is a must-visit when in Sai Kung. It’s famous for being the only place accessible by foot to see the famous volcanic hexagonal pillars. The High Island Geo-Trail takes one hour and is a scenic walk around the reservoir. 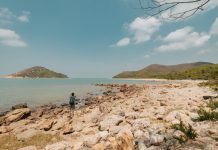 It’s actually possible to hike from Sai Kung Pier itself: take bus 94 from the Sai Kung Bus Terminus to Pak Tam Chung, then hike 9km along Tai Mong Tsai Rd and Sai Kung Man Kee Rd, following the MacLehose Stage One trail to the East Dam. Alternatively, a taxi takes 25 minutes from Sai Kung Pier, but make sure you have a phone to book a taxi on the way back. 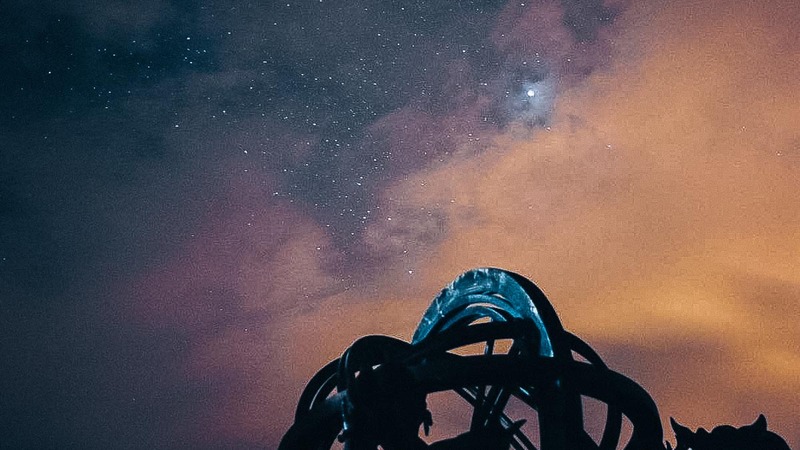 Hong Kong’s first public stargazing facility, the Sai Kung Astropark is split into three zones: the educational zone (with a mini planetarium for learning), the Naked-Eye Observation Area (with benches for stargazing — romantic! ), and the Telescopic Observation Area (with binoculars, star-trackers and telescopes for closet astronomers). How to get there: Take a 10-min taxi from High Island East Dam Reservoir. It’s located inside the Chong Hing Water Sports Centre. The famous Sharp Island is home to two famous beaches — the Kiu Tsui Beach and Half Moon Bay (Hap Mun Bay) Beach. Both beaches have basic amenities — kiosks selling food, BBQ pits, shower/toilet facilities, etc. Kiu Tsui Beach, the larger of the two, is where travellers go to see the iconic tombolo (natural landform) that connects to the Kiu Tau Islet. You can even walk over the tombolo during low tide (usually before 12PM), which makes for great pictures. Half Moon Bay Beach is more known for swimming — in clear, blue waters against mountainous views and rock formations. To get from Kiu Tsui Beach to Half Moon Beach, either hike (1.6km, about one hour) over a hill or wait for the boat transfer (~HK$40) to arrive again. We recommend the hike because it’s scenic and mostly well-paved with staircases. How to get there: By 15-min boat transfer (local kaitos) from Sai Kung Pier. Departs every 15 mins, last boat departs Sai Kung Pier at 5:30PM. Boats to Sharp Island will first stop at Kiu Tsui Port, then at Half Moon Bay Pier. 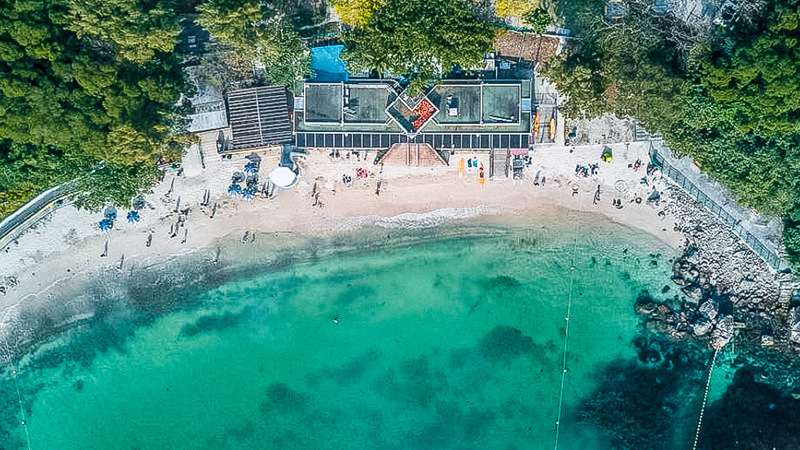 If you have time for only one beach, head to Long Ke Wan Beach. 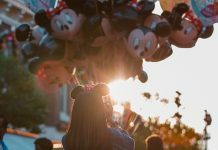 It’s less populated than the others and has no facilities (but that’s part of the magic! ), so stock up with water and snacks at Sai Kung Pier before heading over. This beach doubles up as a campsite, so bring camping equipment if you wish to spend the night. How to get there: From High Island East Dam Reservoir, walk 1.5km (20 mins) through the park on the MacLehose Trail to Long Ke Beach. The Trio Beach is a recent discovery secluded and hidden from the tourist eye. It offers clean, soft, sand great for sunbathing and clear waters for swimming, with Clearwater Bay in the horizon. There are small kiosks and toilet facilities available, but bring your own food. Note that this beach can’t be accessed straight from Sai Kung Pier unlike the others. How to get there: Take Bus 92/96R/792M from Sai Kung Bus Terminus to Tai Chung Hau, then walk 300m on Che Keng Tuk Road towards Sai Kung International Pre-School. Turn right to the start of the 3km trail. Alternatively, take bus 92/96R or Mini-Bus 1/1A to Pak Sha Wan bus stop. Walk towards the pier, and take a sampan boat (HK$20 two-way, 10-min ride). A protected area and home to more than 120 types of corals, Hoi Ha Wan Marine Park‘s a great place to snorkel. 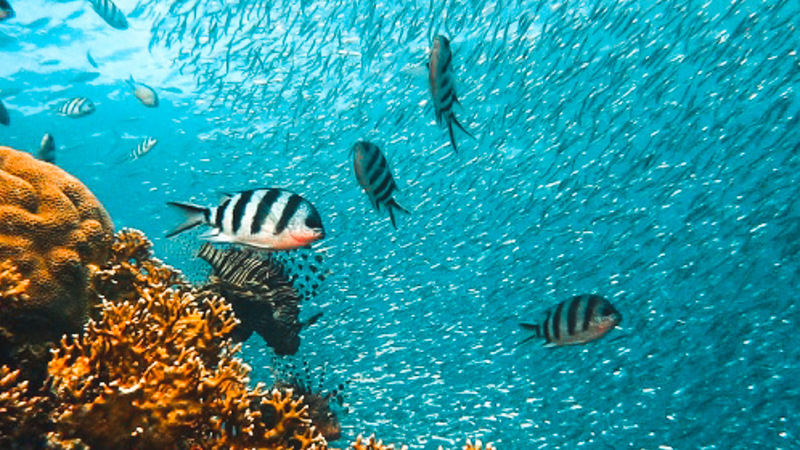 Underwater, look out for parrot fish, clownfish and even octopus. Snorkel equipment can be rented (prices vary) from the Hoi Ha Village. If being above water is more your flow, rent a kayak at the village or go stand-up paddling to explore the area. Water sports here are easy because there are no waves — the bay is walled up on all sides. 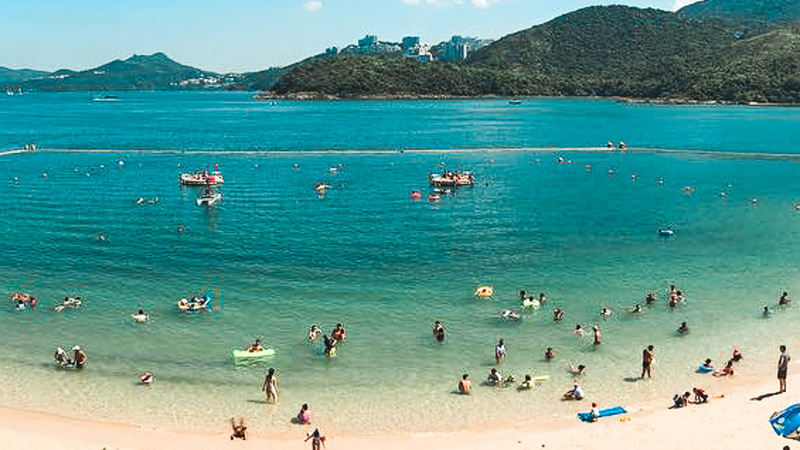 After the activities, kick back and relax at Hoi Ha Wan Beach, or take a stroll in the village for food from local vendors. 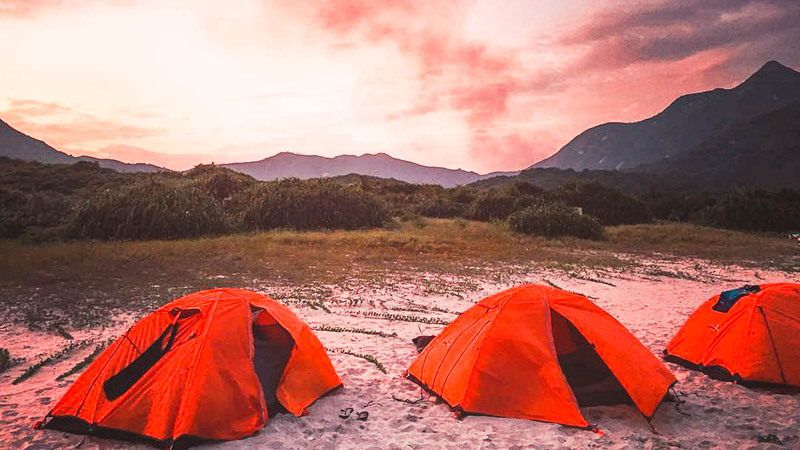 Campsites are scattered all across the island for you to enjoy the Sai Kung outdoors overnight. 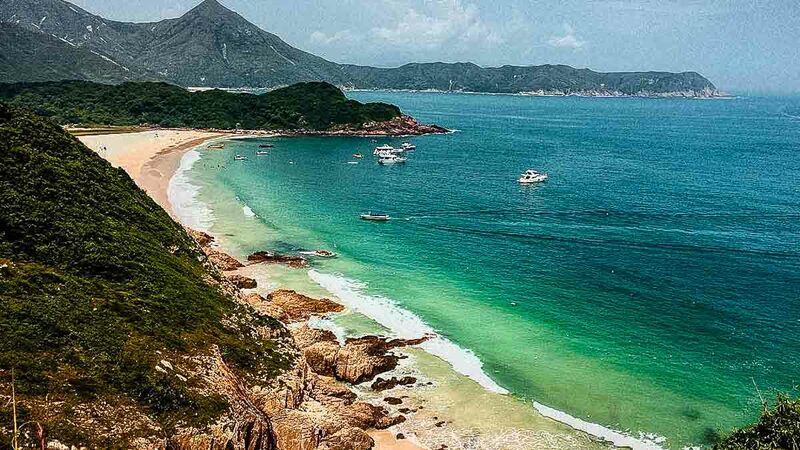 The most popular and accessible include those at Ham Tin Beach, Tai Long Wan and Long Ke Wan. Spend the day adventuring (hiking, swimming or beach hopping) before watching the sunset outside your tent. 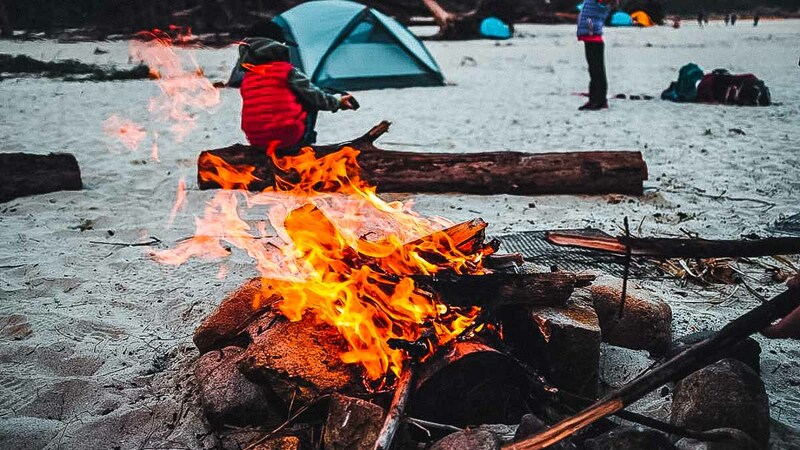 Cook simple dinner over a campfire and stargaze over cold beers before retiring for the night, and wake up to a beautiful sunrise. Sounds like the perfect outdoor escapade to me! If you’re hyped about camping but less into organising the nitty gritty (or lugging all the tools from home! ), go for a curated 2D1N camping experience because everything’s provided by the tour operator, like tents and cooking equipment. 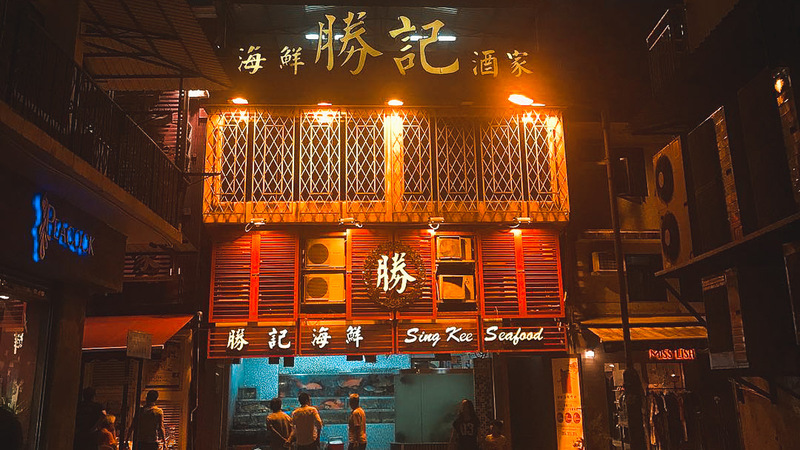 Besides being an old town, Sai Kung is slowly transforming into a hipster enclave as well in terms of its F&B offerings. Treat yourself to a western meal in the day, and then to a local seafood feast at night! 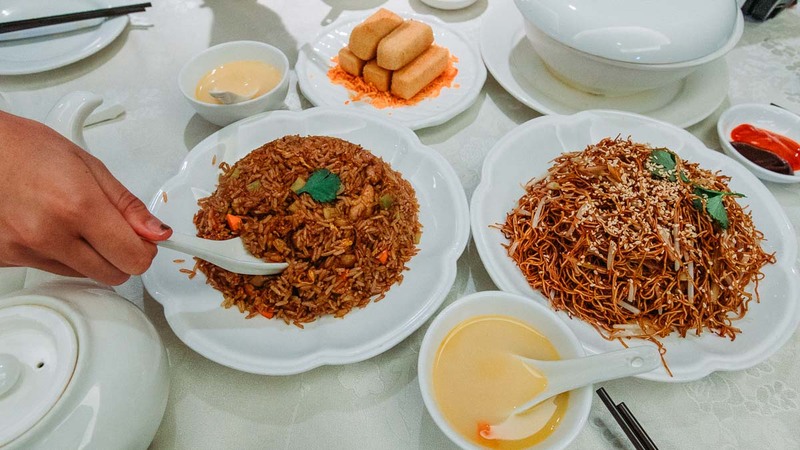 Famous for their Fried Toufu with Chili and Garlic, Fish Soup with Potatoes and Tomatoes and Fried Egg Noodle, Loaf On‘s a little pricey but worth the splurge high-quality food. An affordable alternative, tuck into fresh seafood at a rooftop terrace overlooking the sea at Chuen Kee Seafood. 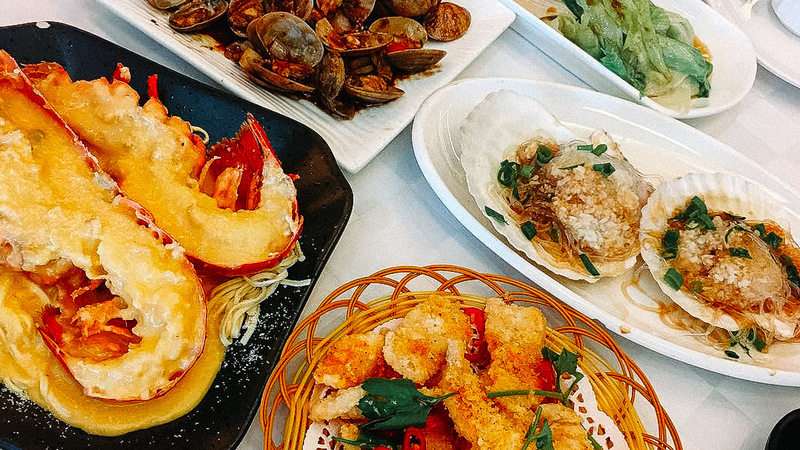 Must-tries: Australia lobster with cheese sauce and e-fu noodles, abalone in pepper and salt, steamed scallops with garlic. Sing Kee Seafood Restaurant is known for its unique methods of cooking abalone through deep-frying and traditional steaming. The restaurant’s three floors are all differently themed, so you’re in for a gourmet experience in style. 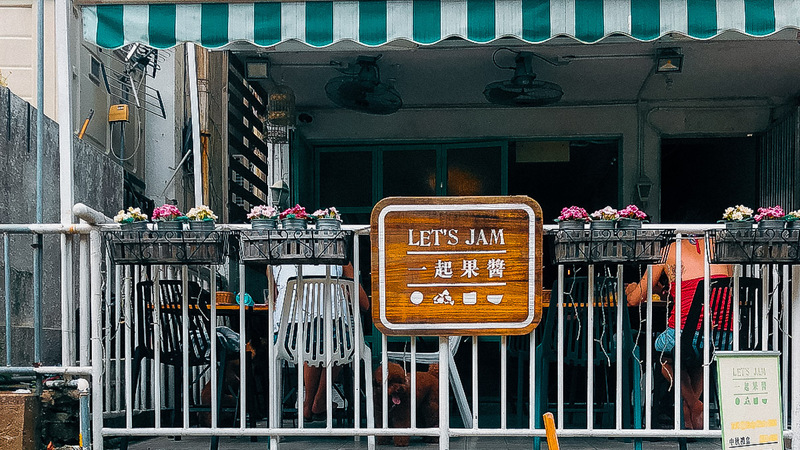 Tucked in a cosy corner of Sai Kung’s Old Town, Let’s Jam is popular amongst the locals. Serving up generous portions at wallet-friendly prices, this is a great place to kick off your day at Sai Kung. 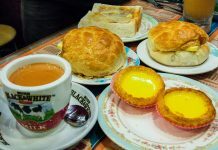 Popular dishes include their all-day breakfast (scrambled eggs, sausage, bacon, beans and toast for only HK$79) and their toast with signature homemade jam (HK$49). 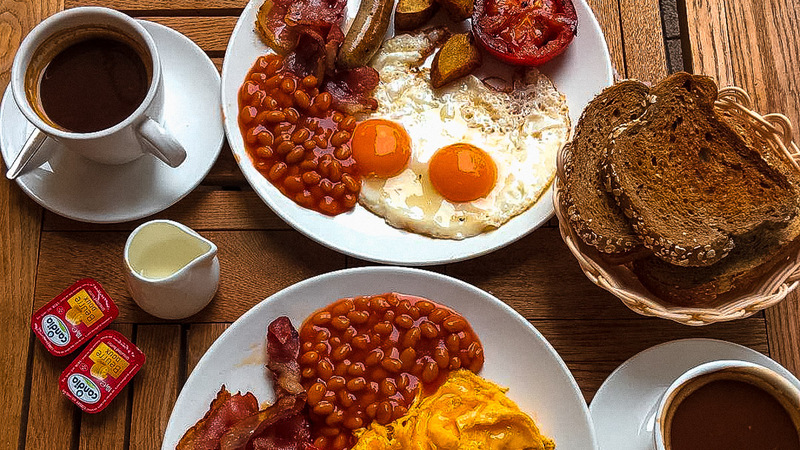 Have brunch alfresco style at Ali Oli Cafe with a full English breakfast including coffee going for HK$78, or pies, pastries and buns for those packing to-go. 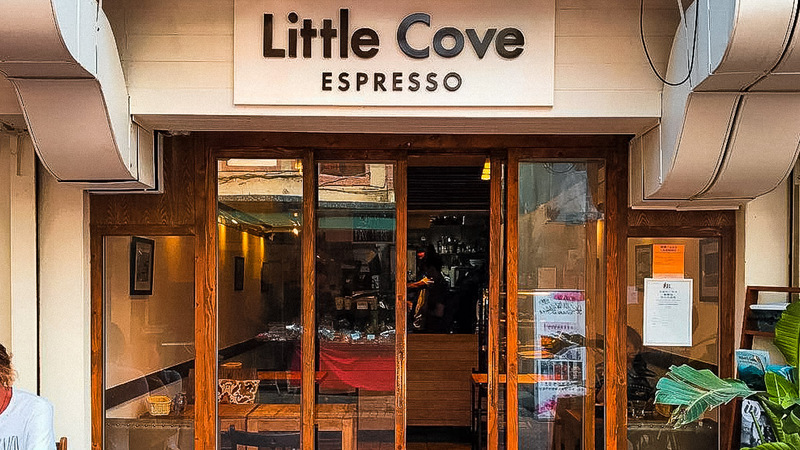 Little Cove Expresso seems to have it all — the best coffee in Sai Kung, organic food and chic interior design. Try their organic scrambled eggs with avocado/rocket on sourdough (HK$95) and smoothie bowls (HK$65)! 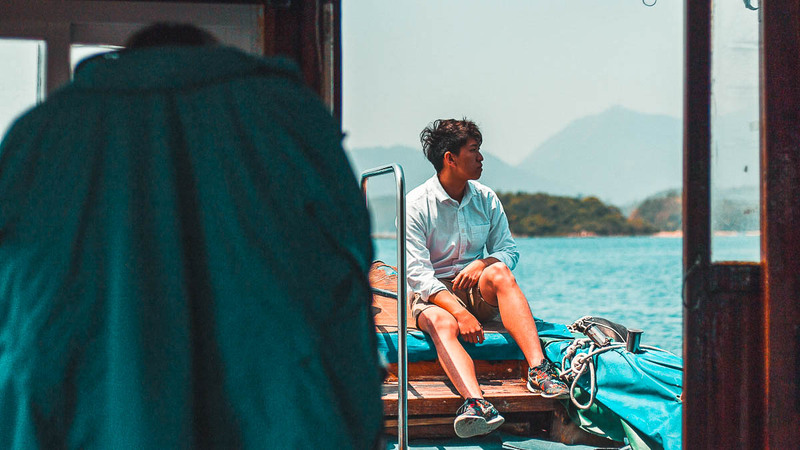 Sai Kung: Worth the Trip? Personally, I’ve always wanted to dig out secret hidden enclaves in Hong Kong that are less explored or the antithesis of what people know the city to be, and Sai Kung has given me all of it. I especially appreciated the peace and quiet while we were there, surrounded by nature and untouched beaches. This precious seaside getaway is also empowered by ecotourism, where local businesses flourish. 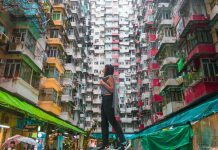 It’s killing two birds with one stone — being able to experience both the busy city life of Hong Kong and the more natural side that’s hidden to tourists, all just a few MTR stops apart. 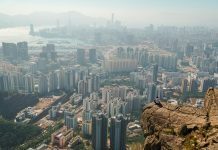 Unlike other countries, you don’t have to travel far distances to experience different landscapes in Hong Kong. 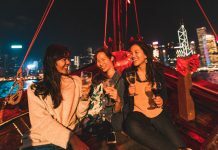 Hit us up if you know of more hidden gems to explore in Hong Kong!